In the land of Linux applications have what is called their "nice" value. This value sets the priority that any given application receives. The nice value ranges from -20 to 19. The lower the number the higher the priority. The higher the priority the the more CPU time a program will get. This comes in handy, say if you are rendering a video that is going to take a long time and can consume a good amount of your CPU cycles. You can set the nice value to give that process a lower priority so it won't consume that much of your CPU. The job will take longer, but you won't notice the huge hit on your processor. But how is this done? Let's take a look at how you can manage the priority of an application. We'll start this with the command line method of changing these values (I'll demonstrate the GUI method in a moment). There are two commands you need to know: nice and renice. You use nice to launch a command with a specific nice value. You use renice when you want to change the priority of a program that is already running. Let's see how those commands are used. Where APPLICATION is the command used to launch the application and NICE_VALUE is the priority (from -20 to 20) that you want to launch the application with. Where NICE_VALUE is the new nice value you want to assign to a process and APPLICATION_PID is the process ID of the application. NOTE: You can't renice with an application name like you can with nice. There is, of course, a much easier way of handling this task. 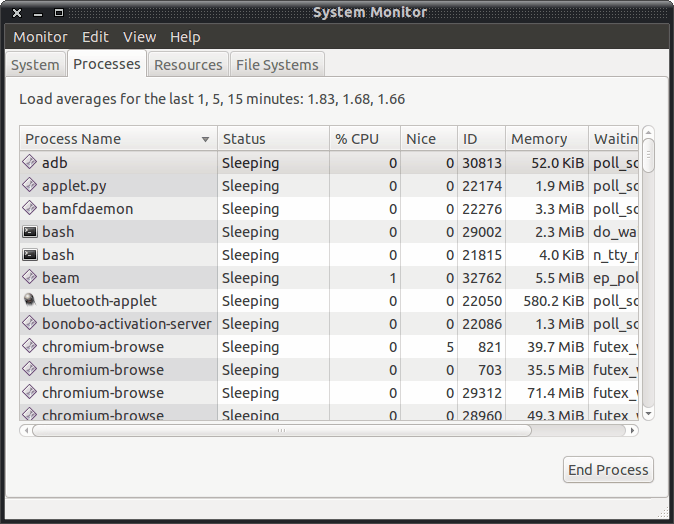 If you open up the System Monitor you will notice a Nice column (see Figure 1). If you select an application and right-click it you will notice the Change Priority entry in the menu. Select that and a new window will appear with a slider allowing you to change the nice value from -20 to 20. Once you have changed that value click the Change Priority button and the new nice value is set. You will probably notice that the majority of applications nice value is set to 0. That is normal priority. You will only want to change this value for certain circumstances - such as a run-away application or when an application will consume a good amount of CPU cycles. Other than that, Linux does a fairly good job managing the priority of the applications both the system and the users run. But it's always nice to know you can step in when necessary. Good article about `nice`. If you’re interested in controlling and monitoring/visualizing groups of processes (e.g. complex applications) on Linux you could check out Librato Silverline (full disclosure: I hack here). Would love any feedback you might have. Thanks, Jack! I did not know about renice. Also, this somewhat crude ability to reprioritize tasks under linux is being revamped somewhat with the introduction of control groups, which give you the ability to prioriizes io, cpu, cpusets, network packet prioritization – which goes a very long way to possibly elminate nice altogether. Also, this somewhat crude ability to reprioritize tasks under linux is being revamped somewhat with the introduction of control groups, which give you the ability to prioritize io, cpu, cpusets (cpu affinity), network packet prioritization – which goes a very long way to possibly eliminate nice altogether. xrenice project, like xkill lets you to renice priority by one click on app.